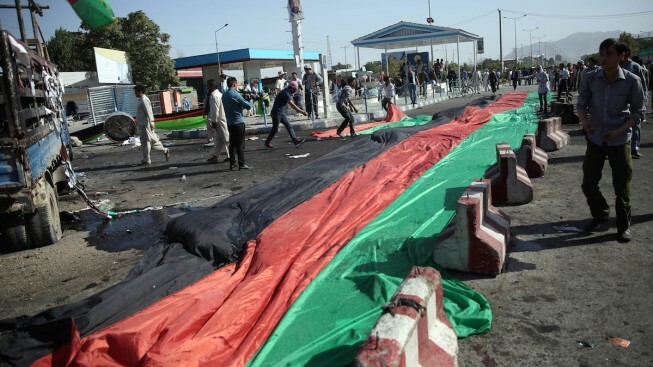 The long Afghan flag is covered the remains of victim's attack, after a suicide attack happened during a demonstration in Kabul, Afghanistan, on July 23, 2016. Suicide bombings in the capital of Afghanistan Saturday killed at least 80 people and injured more than 230, many of whom were taking part in a political demonstration, authorities said. The blasts occurred in Dehmazamg Square near the Kabul Zoo on the main road to Parliament, Health Ministry spokesperson Ismail Kawosi told NBC News. Three suicide bombers worked in tandem in the attacks, according to the Ministry of the Interior. While one bomb was detonated, a second bomb exploded prematurely and a third bomber was shot dead by police. The protesters, mostly ethnic minority Hazaras, were marching to demand that their impoverished home province be included in a major new electricity line, according to The Associated Press. A branch of the terror group ISIS claimed responsibility, according to NBC News consultant Flashpoint Intelligence. That claim has not been verified.